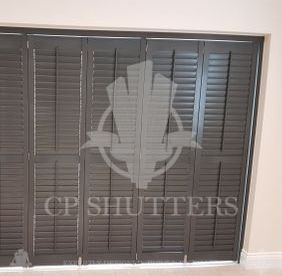 At CP Shutters longevity carries great importance to us as a company. Our business has been grown to last the generations, meaning it will be passed on to our children in many years to come. This legacy will only be possible if we adhere to our core principles, the most important of which that is to provide a product that will stand the test of time. 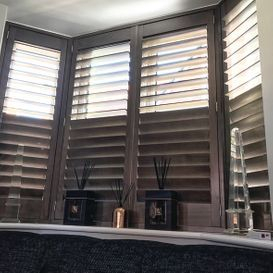 That means our Shutters not only need to be built correctly, but use sustainable materials and processes. None of our ranges are more ecologically friendly than our Emerson range. 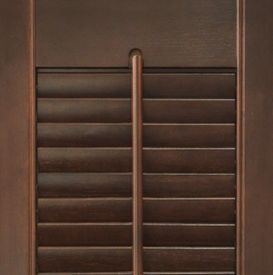 Our Emerson range is the highest quality Shutter product on the market today. Of course the quality between our ranges is consistent with regards to how long they will last, but the way that the Emerson is created is truly unrivaled. The journey to the ultimate Shutter product begins in of all the places, the Solomon islands, situated East of Papua New Guinea, Oceania. 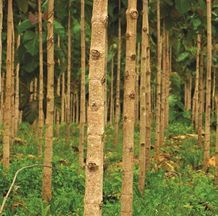 Here grows one of the worlds premium White Teak species that grows at such a rate it can be harvested in as little as 8 years. 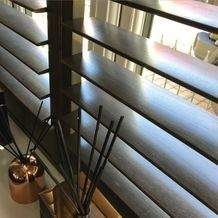 The plantation our factory uses combines the natural carbon reducing properties of the trees themselves with a low impact cultivation program, creating a sustainable, environmentally friendly production line of timber, meaning you do not have to harm to planet, to have quality Shutters. OK So its Ethical, but what can it do that other ranges can't? Wider Range of Louvre Sizes: The Emerson offers a wide range of louvre sizes, 32mm, 47mm, 63mm, 76mm, 89mm & 114mm in addition to this it can also be made with two "flat" louvre sizes, 60mm & 84mm. Another outstanding feature of the Emerson range is its beautiful wood grain. This White Teak is an unrivaled quality timber. Featuring tight and detailed grains, when stained, it produces a truly stunning finish. 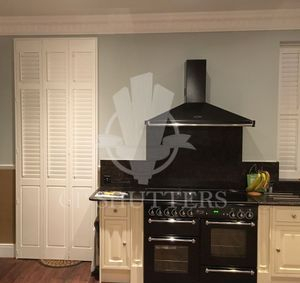 The depth and character really show off the quality nature of this product, adding a touch of sophistication to your home.